On December 15th, the final bill, titled Tax Cuts and Job Acts (TCJA) was agreed upon by the congressional committee. It was approved by the House and the Senate on December 20th and signed by the President on December 22. The House and Senate conference committee report (legislative text and Joint Committee on Taxation estimate) and the conference committee’s Explanatory Statement are both available for download. Click here our Special Report. The bill changes everything – how individuals, businesses, estates, nonprofit organizations, etc. are taxed, including tax rates, tax deductions, credits, and more. It is the most massive tax law change since 1986. To put it in a form of an analogy – if the current tax law is a map; we just got a whole new map. Now we have to determine what directions you need to reach your destination (lower tax liability). Needless to say, the goal of simplicity was not reached. What was accomplished, was simply a change in the rules – lowering rates, removing deductions and creating new calculations to determine taxable income for all types of taxpayers. The final bill is a $1.4 trillion tax cut where the majority of the corporate tax changes being permanent and the individual tax changes being temporary (generally expiring 12/31/25). As you review the following high-level bullet point summary, please keep in mind that there are many other changes within the bill that are not mentioned below. We are attempting to highlight the changes we believe to have the broadest impact. With that said, every situation is different and will require analysis to determine the impact and identify what actions you should take to mitigate any unintended consequences (larger tax liability). Other changes not mentioned below may have an impact on your tax situation. As we approach December 31st, there may be actions you need to take to mitigate any negative impact or take advantage of opportunities. There will also be actions you need to take in the first few months of 2018 and throughout 2018 as regulations and further details of the tax law changes are revealed. Please reach out to your tax advisor to discuss what matters to you. Retains seven brackets, but at reduced rates, including a top marginal rate of 37 percent. The current tax rates of 10%, 15%, 25%, 28%, 33%, 35%, 39.6% rates would be replaced with tax rates of 10%, 12%, 22%, 24%, 32%, 35%, and 37%. Provisions sunset at end of 2025. Increases the standard deduction to $12,000 for single filers, $18,000 for heads of household, and $24,000 for joint filers, while eliminating the additional standard deduction and the personal exemption. Provisions sunset at the end of 2025. Retains the mortgage interest deduction for acquisition, but limited (for new purchases) to $750,000 in mortgage debt, while eliminating the deduction for equity debt. Reverts back to $1 million 1/1/26, regardless of when debt occurred. Available for second homes. Caps the state and local tax deduction at $10,000 (property plus choice of income or sales taxes, as under current law), except for taxes paid or accrued in carrying on a trade or business. Medical expense deduction – applies to expenses that exceed 7.5% of AGI in 2017 and 2018, and expenses that exceed 10% of AGI thereafter. The medical expense deduction threshold is lowered to 7.5 percent for 2018, and reverts to 10 percent thereafter. Eliminates other itemized deductions. Increases the child tax credit to $2,000. Of this, $1,400 would be refundable, with the refundable portion indexed to inflation. All dependents ineligible for the child tax credit are eligible for a new $500 per-person family tax credit. Provisions begin to phase out at $400,000 ($200,000 for single filers). Social Security Numbers required for portions of the above. All provisions sunset at the end of 2025. Expands the use of 529 accounts to cover tuition for students in K-12 private. Allows distributions of up to $10,000 per student tax-free from 529 accounts to be used for elementary, secondary and higher tuition. Repeals the moving expense deduction (except for active duty military personnel) and eliminates the alimony deduction effective 2019 (though those receiving alimony no longer count it as income). Retains other above-the-line deductions, including educator expenses and student loan interest. Graduate student tuition waivers also remain in place. Interest Expenses - Caps net interest deduction at 30 percent of earnings before interest, taxes, depreciation, and amortization (EBITDA) for four years, and 30 percent of earnings before interest and taxes (EBIT) thereafter. Limits deduction to net interest expense that exceeds 30% of adjusted taxable income (ATI). Initially, ATI computed without regard to depreciation, amortization, or depletion. Beginning in 2022, ATI would be decreased by those items. Regulated utilities generally excepted. Business Credits - modifies, but does not eliminate, the rehabilitation credit and the orphan drug credit, while limiting the deduction for FDIC premiums. Research and development credit is retained without modification from current law. Cash method of accounting - Increases eligibility to businesses with up to $25 million in income; taxpayers that meet the new $25 million threshold are also not required to account for inventories under Sec. 471 or apply 263A; Accounting method changes may be treated as initiated by the taxpayer and made with the consent of the Secretary. 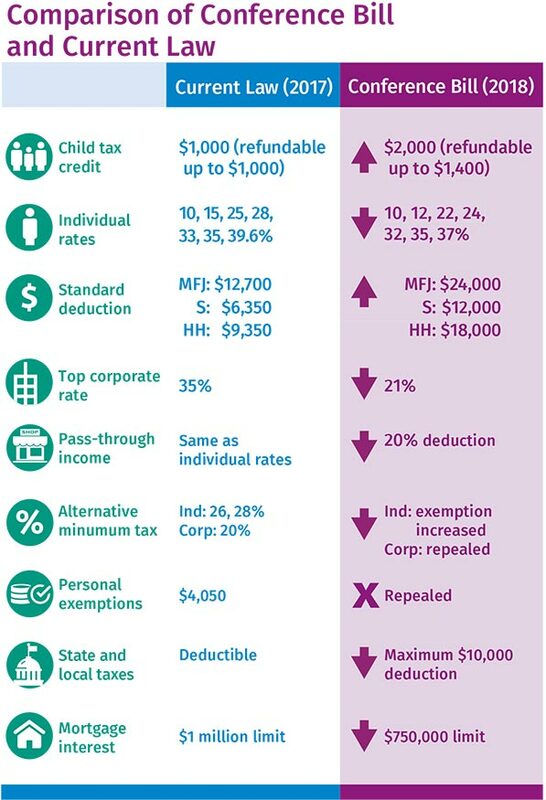 Pass-through Income – 20% deduction for pass-through income limited to the greater of (a) 50 percent of wage income or (b) 25 percent of wage income plus 2.5 percent of the cost of tangible depreciable property for qualifying businesses, including publicly traded partnerships but not including certain service providers. Limitations (both caps and exclusions) do not apply for those with incomes below $315,000 (joint), and phase out over a $100,000 range. Moves to a territorial system with anti-abuse rules and a base erosion anti-abuse tax (BEAT) at a standard rate of 5 percent of modified taxable income over an amount equal to regular tax liability for the first year, then 10 percent through 2025 and 12.5 percent thereafter, with higher rates for banks. Deemed repatriation - Enacts deemed repatriation of currently deferred foreign profits at a rate of 15.5 percent for liquid assets and 8.0 percent for illiquid assets.